1On 18th and 19th November, 2005 the Groupe de Recherches Anglo-Américaines de Tours invited high-ranking experts in the field of Children’s studies and over seventy researchers from all over the world to attend its conference Histoires d’enfant, histoires d’enfance / Stories for Children, Histories of Childhood. 2As Rosie Findlay makes clear in her introduction to the first volume of essays, this interdisciplinary conference, which aimed to explore childhood as a highly complex, dynamic cultural construct, combined historical and literary approaches to the perceptions of the child. The first volume is dedicated to papers on social history and civilisation. It focuses on global discourses, children and childhood in various centuries, and childhood through art and the media. The papers collected in the present volume are devoted to the representations of the child and childhood in fiction. 4The following four papers contribute to exploring how the child and children’s fiction are conceptualised and theorised. In ‘“ Wrecked at the critical point where the stream and river meet’? : Lewis Carroll and the deconstruction of Childhood,” Karen McGavock focuses on the modern construction of childhood, and analyses the contribution of childhood to is own deconstruction. In “ʻSaving the World before Bedtimeʼ: The Puer Aeternus as a New Paradigm for Selfhood,” Karen Coats examines contemporary children’s films, and considers the eternal child to be a highly effective model for self-fashioning in contemporary culture. Virginie Douglas points out that the child in children’s literature is a fragmented agency; her paper, “Desperately Seeking the Child in Children’s Books,” concentrates on the adult’s nostalgic, ambiguous gaze upon youth. In " Childist Criticism and the Silenced Voice of the Child: A Widening Critical and Institutional Re-Consideration of Children’s Literature,” Sébastien Chapleau approaches children’s fiction from a genealogical perspective and looks at texts produced by children themselves. 5The following three articles show how children’s literature rewrites and appropriates archetypal figures and motifs: Sandra L. Beckett analyses several crossover versions of “Little Red Riding Hood”; Kamila Vránková’s article explores the time-travel motif in the stories of Lucy Boston, Philippa Pearce and Penelope Lively as viewed through Deleuze’s theory of difference and repetition; in “‘Helpless and a cripple’: the disabled child in children’s literature and child rescue discourses,” Margot Hillel suggests that in the nineteenth and early twentieth centuries, the idealised disabled child often functions as a redeemer. 6In “The Art of Imagining Childhood in the Eighteenth Century,” Jennifer Milam analyses Rococo representations of children (Lancret, Chardin, Fragonard, Greuze and Van Loo); she shows how these images contributed to the Enlightenment discovery of the child. Joetta Harty’s article examines the representation of childhood in the imaginary kingdoms created by children themselves during the Romantic period and concentrates upon the works of Thomas Malkin, Thomas and William De Quincey, Charlotte, Branwell, Emily and Anne Brontë. Nathalie Jaëck’s paper, “Pip and Jim Hawkins: the spontaneous generation of two mistakes of fiction,” shows how, for Dickens and Stevenson, “children become the form of the book, rather than its material.” In “The language of decadent childhood in Oscar Wilde’s tales,” Sébastien Salbayre explores the way the identity of Wildean children is constructed and disclosed in “The Happy Prince,” “The Selfish Giant,” “The Young King” and “The Star-Child.” Shurlee Swain takes a close look at the discursive strategies resorted to in British and Australian rescue literature (1850-1915). 7Rose-May Pham Dinh analyses “the relevance of WW2 experiences for contemporary children” in four recent British, American and Australian novels. Meanwhile, Claude Julien shows how Christopher Paul Curtis rewrites, or fails to rewrite, history in The Watsons Go to Birmingham-1963 (1995). Teresa Gibert argues that Shizuye Takashima and Joy Kogawa turned their own traumatic childhood experiences of war into “suitable” poetic pieces of fiction (A Child in Prison Camp and Naomi’s Road). 8In “Childhood and Sacrifice in the Contemporary Maori Novel,” Ulrika Andersson discusses the reasons why the Romantic figure of the suffering child has become an important character in postcolonial New Zealand novels. Adriana Serban addresses the issue of translation in relation to children’s literature and takes a close look at two English versions of a fairy tale taken from the Romanian folklore — “Youth Everlasting and Life without End” and “Eternal Life and Everlasting Youth.” Lalita Jagtiani Naumann examines the status of the girl child — a concept that highlights “the Indian perspective in which the movements and thought patterns of children, especially girls, are controlled according to their gender so as to mould the personality of the adult” — as it is constructed in Shashi Deshpande’s The Dark Holds No Terror (1980). Swapna M. Banerjee’s paper addresses epistemological issues and analyses the thematic, stylistic and generic diversity that characterizes the periodical literature for children published in colonial India. 9The present volume concludes with three papers written in French. In “De l’enfant mort à l’éternel enfant: l’histoire sans fin de J.M. Barrie,” Monique Chassagnol considers the Peter Pan books to be a never-ending adventure in which James Matthew Barrie keeps writing the same story about the eternal child. Cécile Boulaire examines the specificity of the epistolary form in children’s literature. Isabelle Nières-Chevrel’s paper, “La Civilité puérile et honnête de Maurice Boutet de Monvel; contraintes bourgeoises et turbulence enfantine,” examines how the French artist’s picture book ironically comments upon the good manners taught to upper-middleclass children in the late nineteenth century. 10The organisers are grateful to all the speakers, who brought new and specific input to the debate about the history of childhood and children’s literature, as well as to the members of the audience, who contributed to such a successful conference. 11Their warmest thanks go to William Findlay, then Director of the Groupe de Recherches Anglo-Américaines de Tours, for introducing the conference, to Guy Reynier, Director of International Relations, for opening the conference, and to the Department librarian, Jean-Yves Peyrot, for his exceptional exhibition on Children and Children’s Books in the University Library. 14The organisers also wish to express their thanks to the Conseil Régional du Centre, the Conseil Scientifique and the UFR Lettres et Langues of the University of Tours for backing their project as well as the publication of these Acts. Teaches English literature at the University of Tours. He is the coauthor, with Nathalie Vincent-Arnaud, of L’Analyse stylistique: Textes littéraires d’anglais (Toulouse: Presses Universitaires du Mirail, 2006). He has also published several articles on the works of Oscar Wilde and Joe Orton. SALBAYRE, Sebastien. 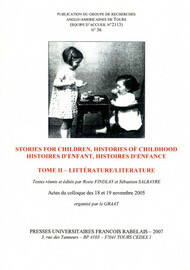 Introduction In : Stories For Children, Histories of Childhood / Histoires d'enfant, histoires d'enfance. Tome II : Littérature / Literature [en ligne]. Tours : Presses universitaires François-Rabelais, 2007 (généré le 22 avril 2019). Disponible sur Internet : <http://books.openedition.org/pufr/4935>. ISBN : 9782869064836. DOI : 10.4000/books.pufr.4935. Salbayre, Sebastien. “Introduction”. Findlay, Rosie, et Sébastien Salbayre. Stories For Children, Histories of Childhood / Histoires d'enfant, histoires d'enfance. Tome II : Littérature / Literature. Tours : Presses universitaires François-Rabelais, 2007. (pp. 9-12) Web. <http://books.openedition.org/pufr/4935>. FINDLAY, Rosie (dir.) ; SALBAYRE, Sébastien (dir.). Stories For Children, Histories of Childhood / Histoires d'enfant, histoires d'enfance. Tome II : Littérature / Literature. Nouvelle édition [en ligne]. Tours : Presses universitaires François-Rabelais, 2007 (généré le 22 avril 2019). Disponible sur Internet : <http://books.openedition.org/pufr/4932>. ISBN : 9782869064836. DOI : 10.4000/books.pufr.4932.